I was flipping through a home shopping catalogue that came in one of Claire's magazines and I stumbled on this little delight. It's a Banana Guard - essentially, just an individual lunchbox for your banana to protect it from getting mashed in your bag. What a good idea, however there's one thing that struck me as rather odd... the shape. 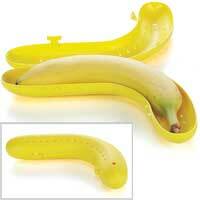 The catalogue (and website) state it's "designed to accommodate virtually every shape and size of banana". My first thought was - except the bendy ones. What ever happened to bendy "moon shaped" bananas? Bananas now seem to bend in the first 5 centimetres and then go straight for the rest. This can't have been the case all the time... ask anyone to draw a banana and it'll resemble a crescent rather than the semi-straight things we get today. I'm tempted to get one of these just to see if I can find a banana that doesn't fit. Granted, I may have to travel half way round the world to some country that doesn't have rules on how fruit and veg should bend and look - before you ask, yes the EU has rules on what fruit and veg should look like (the BBC list a few in this strange article on bananas), however I feel Spain doesn't follow these rules - they have some of the most real and rustic looking fruit and veg I've ever seen.